As Abraham prepares to sacrifice Isaac, he is stopped by the angel of God. T IS GOD'S will that people show their love for him by what they do. You remember how God wished to have the first man and woman show their love for him. He planted in their garden-home a test-tree, the fruit of which he commanded them not to eat. And you remember also how they failed to obey his command, and so failed to show their love. Abraham always listened to God's voice and obeyed. He left his own people and his homeland to journey into a country that he did not know, because God called him. And in our last story he sent Ishmael and Hagar away because God told him to do as Sarah had said. Even when it did not seem easy to obey, Abraham was always ready to do God's bidding. After the baby Isaac came into Abraham's life, God saw that Abraham's love for the little boy was very strong. And the passing years increased this love, because Abraham knew that Isaac was the child God had promised, and he loved Isaac as a gift from God. He looked forward to the time when Isaac should become a man and should have children also, and he knew that these children should grow up and become the fathers of more people, because God had told him these things. And so whenever he looked upon Isaac and thought about these things, he knew that in this child were bound up all the promises of God for the coming years. By and by the time came when Isaac grew far away from baby-hood into youth. Abraham had taught him to know about God and to worship him. Perhaps he had taken Isaac with him when he offered gifts upon the altar, and he had told Isaac that God would accept the gifts and hear his prayers if he would try to do right. And Isaac loved his father Abraham, and was obedient to. him. When God saw how dearly Abraham loved his son, and how obedient and loving Isaac was toward his father, he thought, "I must prove Abraham this once more, and see whether he loves me better than he loves the gift-child I have given." So he called to Abraham one day, and Abraham answered, "Behold, here am I." Then God said, "Take your son, your only son, Isaac, whom you love so much, and go into the land of Moriah. There give him back to me as an offering upon an altar, which you must build at the place I will show." Abraham did not know the reason why God should ask him to give Isaac back as an offering. He could not understand how the promises concerning Isaac would be fulfilled if now he must offer Isaac upon an altar, just like the lambs which he had given to God at other times. But Abraham believed that God understood why, and so he was not afraid to obey. The land of Moriah was some distance from Abraham's tent, and the journey there would require a few days' time. Abraham knew this, and he prepared to start at once. He called two young men servants and Isaac, then saddled his donkey, and they started away. They took wood and fire with which to burn the offering, and traveled on and on for two days, sleeping at night under the trees. On the third day Abraham saw the mountain where God wanted him to build the altar and offer his gift. He left the servants with the donkey to wait by the roadside, while he and Isaac should go on alone. Isaac carried the wood upon his shoulder, and Abraham took the vessel containing the fire. As they climbed the mountain-side together, Isaac began to wonder why his father had forgotten to bring a lamb for an offering. He did not know what God had asked Abraham to give. He did not understand why they were going so far from home to build the altar. So he said, "My father, see, here is wood and fire for the altar, but where is the lamb for an offering?" Abraham replied, "God will provide himself a lamb." When they reached the place God had appointed, Abraham built an altar, laid the wood upon it, and then bound Isaac's hands and feet and placed him upon the wood. 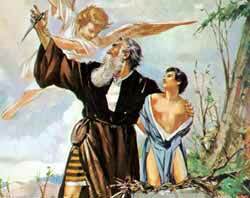 Next he took his knife, and was about to kill Isaac when a loud voice called to him out of the sky, "Abraham! Abraham!" The old man stopped to listen, and the angel of God said to him, "Do not harm Isaac. Now I know that you love God even better than you love your child. Untie his hands and his feet, and let him go." At this Abraham saw a ram caught by its horns in a thicket near by. He took this animal and offered it instead of his son Isaac. Afterward the angel called to Abraham from the sky again, and said, "Because you have not withheld your dearly loved child from me, I will surely bless you and will cause your descendants to be as many as the stars in the heavens and as the sands upon the seashore. And I will bless all the nations of the earth through your descendants, because you have obeyed my voice." No doubt it was a happy father and son who walked down the mountain-side together; for now Abraham knew that he had surely pleased God, and Isaac knew that his life was precious in God's sight. Abraham called the name of the place where he built the altar, Jehovah Jireh, which means in his language, "The Lord will provide." Then they returned to the young men servants who were wait-ing by the roadside, and then journeyed on to their home at Beersheba., where Abraham had planted trees and digged a well some time before this story. Here Abraham lived for many years.